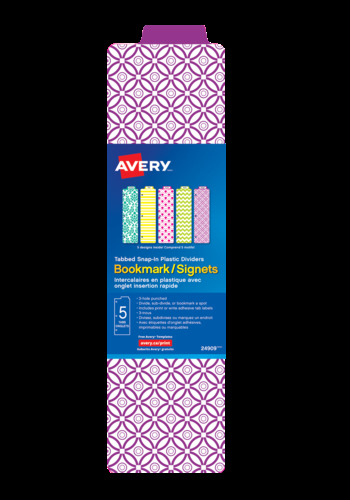 These slim, durable Snap-In Bookmark Dividers are a fun way to divide, subdivide or bookmark a spot in your planner, binder or journal. They quickly snap in and out of your binder without having to open the rings. These slim, durable Snap-In Bookmark Dividers are a fun way to divide, subdivide or bookmark a spot in your planner, binder or journal. They quickly snap in and out of your binder without having to open the rings. Perfect for office organizers, daily planners, recipe binders, schoolwork binders and more. The pack includes five tabbed bookmarks in assorted colours. You can easily customize your tabs by handwriting or printing or handwriting on the included tab labels with free templates.